In his final volume, award-nominated author Tony Ruggiero weaves a tale of intrigue, secrecy and choices. Commander John Reese will bring an end to the vampire saga—whatever the consequences. But to do so he must defeat the forces that are trying to control him in reality and in his dreams, before the human race as we know it is irreparably changed. 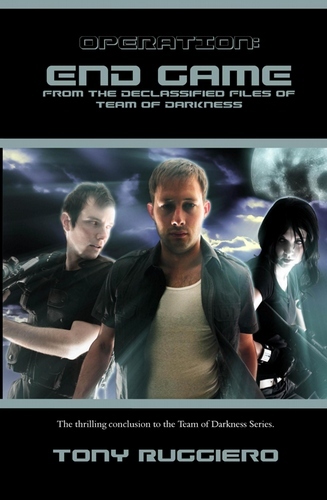 In his waking world, the Agency wants to use Reese to capture additional vampires as Reese continues to hide the truth about the Team of Darkness vampire deaths. Unbeknownst to Reese, The Agency has fallen under the purview of a private organization that can even pull strings in the highest and most covert organizations. Their involvement could change the destiny for all humanity. Being pulled in so many directions over the years, Reese’s sanity is fragile. He has debated giving up his humanity and he has sacrificed much to understand the enigmatic life of the vampire. But even he has had enough. Reese vows that finally there will be a resolution to it all. Yet he realizes that there is only one letter that stands between the two distinctly different meanings of the words resolution and revolution. And that one letter is a V.